"Clearly, this is someone who not only celebrates cheese, but also the written word, which is what makes Immortal Milk such a great read." "Foodies and travel junkies will salute this terrific tale, as will any reader in line for a fact-filled, fun read—a winner!" "Memorable ... bouncing between travelog and poetry, history and buying guide ... LeMay is an engaging writer .... This will appeal to readers with high literary sensibilities looking for an erudite intro to the appreciation of cheese." "Clifton Fadiman once called cheese 'milk's leap toward immortality.' LeMay will tell you why cheese will likely always flavor our culinary imaginations." "Accompanied by his girl Chuck, LeMay drained whey, helped birth a goat, and smuggled unpasteurized Sainte-Maure into the U.S., but mostly he ate—and the way he describes each bite is exhilarating .... LeMay makes cheese seem accessible—no, necessary." "Immortal Milk, with its flights of fun and its surprisingly rich store of information, takes you to a place deeper than simple cheese-love; it takes you into cheese-geekery." "LeMay's collection of essays is a fun and fascinating look at almost everything cheese." "Eric LeMay's Immortal Milk does for cheese all that ought to be done for cheese: it takes something micro, the history of milk gone bad, and turns it into something macro, the story of how the way we eat becomes the way we live." "Less a food history than a manifesto of cheese passion." "The next best thing to tasting the cheese itself .... a warm, even gooey, appreciation of a much-loved and often misunderstood food." "The narrative here is personal, insightful and passionate, and we think it will be treasured by any cheese lover on your list." "An elegant and nuanced brand of food writing .... For student foodies, or even just the average cheese-lover, Immortal Milk may hit the ideal blend of education and indulgence." "It's a celebration of what's, essentially, milk so bad it's good." "The book weaves travel stories with in-depth research about all things cheese - including a terrific chapter about why we call things “cheesy”.... I had a lot of fun reading his milky musings." "LeMay aims to encourage readers to delve into the world of cheese without trepidation, even supplying a helpful gazetteer of cheese sources and a chart for pairing food and cheese fearlessly." "A great book on the subject." Parts of this site require the latest version of the Macromedia Flash Player. "Travel writing, food writing, and intellectual obsession, such is the intriguing blend of elements to be savored in Eric LeMay’s one-of-a-kind Immortal Milk: Adventures in Cheese. The author journeys through France, Italy, and all over the US, tasting, sniffing, and endlessly cogitating the allure of a food that achieves its greatest flavors at points along the path where 'milk goes from its most lively and life-giving to its inevitable end as rot.' Ooh-la-lait!" "[T]oo fun and smart to put down .... The author is a consummate storyteller, offering readers a detailed account of every situation matched with pithy commentary. Part rhapsody, part comic rant, each chapter .... is a literary joy ride that is both informative and insightful, engaging readers through a unique appreciation for 'the sparks that ﬂy between the enthusiast’s love and the expert’s knowledge' of cheese." "Turn off the Food Channel, come out of your dark cave, cut off a chunk of Jura Erguel, settle into that comfy chair, pour yourself a glass of wine—get cozy!—and open a copy of Immortal Milk. For cheese has not only gone viral, but microbial, and you're a better person for it." Staying on the topic of Obama, we asked Eric LeMay, author of Immortal Milk: Adventures in Cheese, to recommend something very different to the president — a special cheese to serve during the holiday season. LeMay suggested "an American cheese, like a Vermont cheddar." "It's a pioneering cheese," he continued, "the homespun American flagship of cheeses." He added that there is "no one out there who doesn't like cheese; it's a unifying banner of America. Even vegans make fake cheese." "There is an enthusiasm to Eric LeMay’s writing that is difficult to describe. His prose feels devoted. His thesis being more of a passionate disquisition than mere documentary. As it comes from a place that is bordering on the obsessive. That is unabashedly, shamelessly, in love with cheese." "Love cheese? Crave good writing? Then you’ll savor these pages .... the most delectable morsels are what can be described only as LeMay’s odes to cheeses, which soar beyond the flavors .... A book for serious epicures." "LeMay chronicles this whole romp with expertly crafted observations and self deprecating humor. Geeks will appreciate his detours into such issues as the meaning of 'cheesy' (as in campy), or how you can compare the experience of eating cheese to reading a novel by Danielle Steele. And while he insists that he and Chuck are just cheese 'enthusiasts' its clear that by the end of the book, they have transported themselves by sheer force of will into experts. Follow along and you'll laugh, you'll cry and you'll learn a lot about cheese." 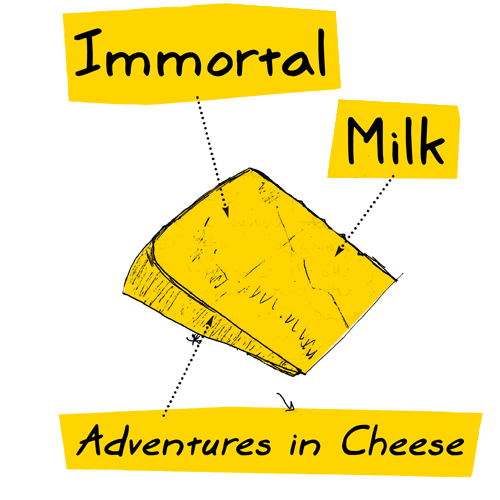 "[A] delightful, screwball take on the world (read: cheese) that combines lucid fun-with-language and uniquely specific observation .... Immortal Milk: Adventures in Cheese celebrates exactly that: milk elevated to Royalty Everlasting. LeMay’s memoir is outstandingly cheesy ... as only a great cheese that ripens beautifully can be." "When I found my mailbox stuffed with ... Immortal Milk, a book devoted to cheese and the adventures of a fellow cheese enthusiast, I gave a little squeak of joy .... This is just the kind of book one could happily leap into, preferably with a nice wedge of Cowgirl Creamery Red Hawk and a glass of Alsatian riesling at your elbow."